Helianthus maximiliani (also, H. maximilianii) is a unusual species of sunflower known by the common name Maximilian sunflower. Native to much of the eastern half of North America. A branching perennial species, growing from a stout rhizome and reaching heights up to two metres. The lance-shaped leaves are narrow, pointed, folded down the mid-vein, and up to 30cm long on large plants. The slender, tall, erect stems and alternately-arranged leaves are covered in rough hairs. The flower heads are surrounded at the base by pointed green phyllaries, which often stick straight out and curl at the tips. The centre is filled with yellow tipped brown disc florets and the circumference is lined with bright yellow ray florets 2-4cm long.The thick rhizome is edible and provided a food, similar to the Jerusalem artichoke, for Native American groups such as the Sioux. The flower heads are attractive to insects and the fruits are eaten by birds. This sunflower is named for Prince Maximilian, a German explorer, who encountered it on his travels in North America. An excellent addition to the flower garden with its lance-shaped, gray-green foliage and profuse late summer blooms. The 100mm bright golden yellow flowers in elongated clusters bloom in August and September and are great fresh cut flowers. Maximilian sunflower is easily grown and typically grows up to 2 metres in height, depending on soil conditions. Best grown in average, dry to medium, well-drained soils, in full sun. Tolerates a wide range of soils, including poor sandy soils, humus, loams and clays. Tolerates dry soils and drought. 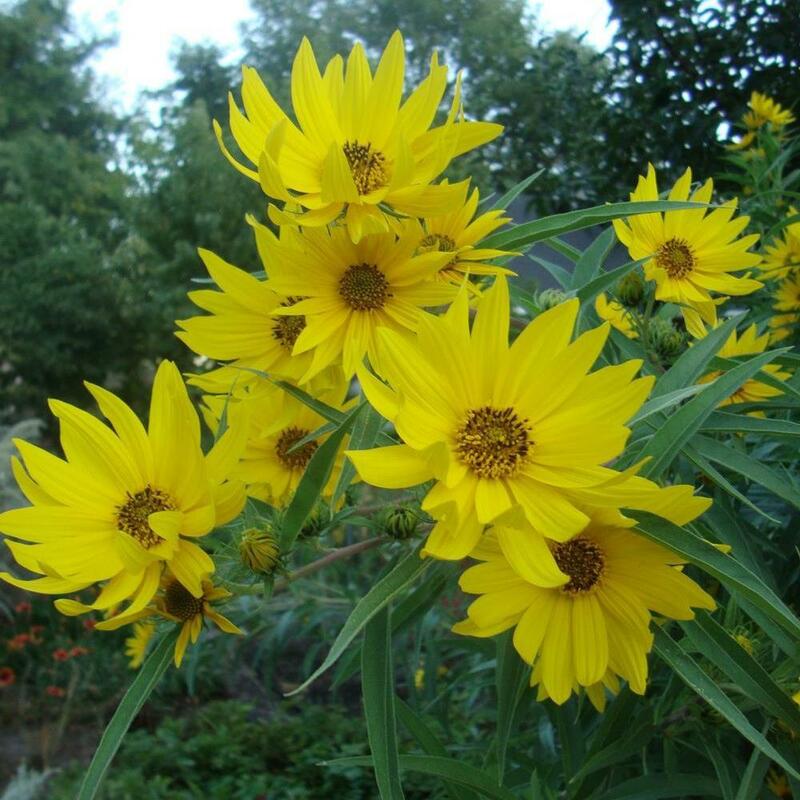 Uses: Plant Maximilian Sunflower as an accent plant in the back border of the flower garden, near a fence row, in amongst shrubs, or in a meadow planting with native prairie grasses. Pruning \ Aftercare : Cut back all previous season foliage and flowers in winter.